I have two beautiful swatches of some up and coming polishes from The Lady Varnishes today! On top of being super beautiful, these polishes are scented! There are new scents coming, and there are already tons of scents. Each polish also comes with a beautiful little charm! First is December's villain of the mont, Mistress of All Evil. 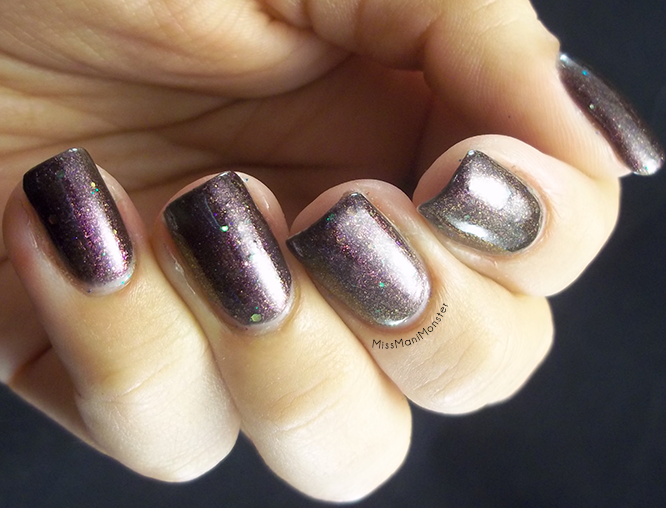 This is stunning deep purple with a goldish- black shift and glitter mixed in. Two coats applied beautifully and shine perfectly with topcoat. This polish will be available until the 31st, and when you purchase 4 polishes including Mistress of All Evil, you'll receive a free minion polish! The other polish is Nothing More, a deep gray with silver glitter and a subtle holo effect. Two coats were perfect with topcoat! These beauties will soon be available for purchase at The Lady Varnishes on Etsy! !